Vendors beckon shoppers to their stores..their cries drowned by the call to prayers sounding from the nearby El Hussein/Husayn Mosque.. the colorful alley-ways of Khan Al Khalili…all create a unique religious and commercial experience not found in many Middle Eastern bazaars. 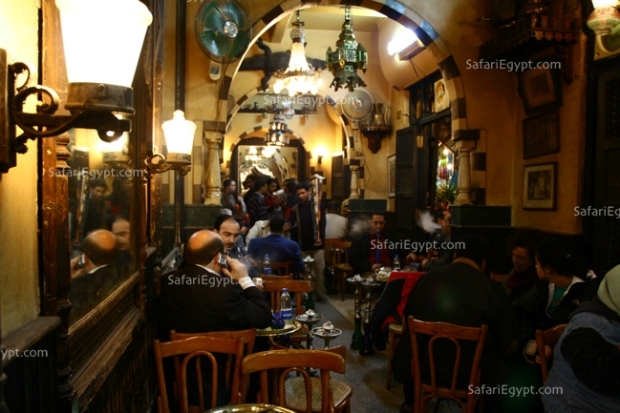 Located in the heart of Fatimid Cairo, Khan El Khalili is a lively, shoppers' paradise, as walking through its winding , narrow streets unveils an endless variety of original Egyptian treasures, as well as their junk replicas, where in all cases "bargaining" is the bazaar's spoken language. Al Khan is a two to three storey commercial building used as a housing and storage facility by merchants, usually built around a courtyard. Historically, Khan Al Khalili was a collection of small and large extensive khans, built by Amir Jarkas Khalili in 1382, setting a market tradition that established Cairo as an active international trade center. Be prepared to be tempted by all kinds of merchandise as you stroll down the historical alley ways of Al Khan: antiques, brass and copperware, carpets, lamps, perfumes, papyrus, gold and silver jewellery, inlaid ivory boxes , to mention but a few of the items on display . However, you'll find that the prices tend to vary widely, and so, the wise shopping equation would be: "wander+ compare+bargain= best buy"
If you want to stretch your imagination and create: Khan Al Khalili is the place to be, as executing your own designs of jewellery , brass lamps, carpets, or even personalizing brass name plates , and cartouches is possible in almost any shop you enter. Usually personalizing at item takes 24 hours, where you are either called to pick up your souvenir the next day, or you are provided with door to door shipping. Recommended personalized souvenir: For a special gift or souvenir, visit the bookbinder in the street behind Al Azhar Mosque, and purchase a quality leather diary or photo album with your initials engraved in gold to eternalize the memory of your visit to Cairo.